Xian is one of the four major ancient civilization capitals, enjoying the equal fame with Athens, Cairo, and Rome. Four tour destinations today: Terracotta Warriors and Horses, Big Wild Goose Pagoda, Shaanxi History Museum. Huashan Moutain: Mt. Huashan is known as ‘The Number One Precipitous Mountain under Heaven’ and one of the five sacred mountains in China. It is famous for its grotesque cliffs,mainly consists of five peaks which look like five petals of a flower.In the past, many emperors came to pray and sacrifice to the god of Mt. Huashan. Mt. 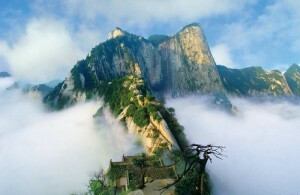 Huashan is also a holy mountain of Taoism. It is said that Lao Zi (Lao Tzu), the founder and patriarch of Taoism, once lived and gave sermons here. Now, many Taoism temples are also located on Mr. Huashan. Finish the last day in Xian by visiting the Ancient City Wall, Forest of Steles Museum. Be transferred to Xian airport afterwards. Forest of Stele Museum: Forest of Steles Museum contains a large Confucian collection of steles cut in 837AD, various calligraphy and scripts telling stories, poems and reports, and early sculptures and objects from imperial tombs.